Conservationists are generally familiar with the concept of adaptive management, but did you know that teams use many different frameworks and associated tools to adaptively manage their projects? These frameworks are often complementary and can build upon each other to improve the practice of conservation. FOS team member Nick Salafsky joined other leading conservation planners in reviewing these frameworks in Conservation Letters. 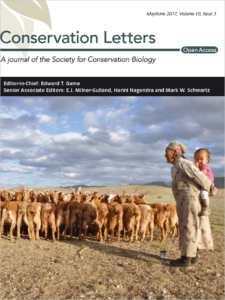 Published this month, the review Decision Support Frameworks and Tools for Conservation compares 5 frameworks for the adaptive management of conservation projects: Strategic Foresight, Systematic Conservation Planning, Structured Decision Making, Open Standards for the Practice of Conservation, and Evidence-Based Practice.